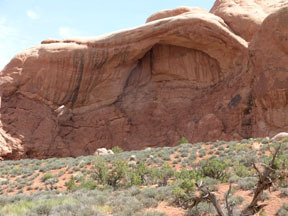 You will visit an example of a typical Entrada Sandstone arch, one of more than 2000 in the Park. Bowing and uplifting of sandstone layers created vertical cracks that gradually eroded into “fins”. Water seeped into the cracks, froze there, and the ice “wedged” off pieces of rock. Wind and water continued their attack over millennia. Some of the fins collapsed of their own weight, while others having just the right hardness and geometry, evolved into arches. These questions are in the process of being changed to better meet the guidelines. You can use either set if you find them before the end of 2014. You can use the new set if you choose. 1-Personally visit the site (yes apparently I have to say this) and email me the names of the people you are submitting answers for. Let me know if it is more than just you. 2-Looking at the North and South window do they appear to be in the same fin. For all these questions, it may help if you take a walk over to the fins. 3-How would you compare the two windows, do you think they were formed using the same process? From Hwy. 191 enter Arches National Park. You should stop at the Visitors’ Center on the way into the park to pick up descriptive pamphlets and see the exhibits. Do not miss the excellent film shown in the new auditorium that describes the geology of rock arches. Follow the road past Balanced Rock, turning right at ~9.2 mi. Proceed another 2.5 mi. to the parking area. 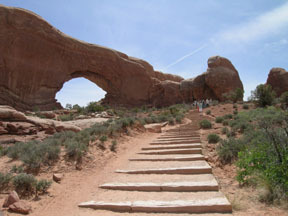 The trail goes to the North and South Windows and Turret Arch. 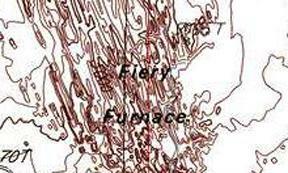 To become familiar with the terms “fins”, “joints” and “evaporite”. To understand how arches and alcoves are formed. The Entrada Sandstone lies atop a massive body of salt that formed in the Paradox Basin ~250 million years ago. The salt is water soluble and plastic. It migrated as the weight of deposited sediments pressed down on it. The overlying rocks bowed upward into an inverted “U” (an anticline). Under this stress the sedimentary rock fractured into parallel slices known as "fins". The fractures are called "joints", weakened places subject to erosion.